I’ve made no secret of the fact that I love films that try to bite off more than they can chew. Ambition is a rare commodity in American cinema these days, and it’s easy to laud the flicks that try hard, even if they end up failing. There’s something to be said for a movie that refuses to give in to the mainstream impulses, and I believe those films should be cherished. But then there’s the rarity, the film that aims high and hits the target perfectly. 50/50 is that kind of transcendent film, wringing a healthy dose of humor out of the dourest of subjects. The film details the trial and tribulations of Adam Lerner, a journalist in his late twenties that comes down with a very rare form of cancer. With his best friend Kyle at his side Adam navigates his new world of hospital visits, chemotherapy, and the oppressive reactions of his parents and live-in girlfriend. The film’s major anchor is the relationship between Adam and Kyle. This is a definite bromance flick, but the comedy doesn’t reach the Apatow level of crudeness. Joseph Gordon-Levitt and Seth Rogen make for a wonderfully believable comic pair, and the two continue to cement their reputations as actors that consistently deliver the goods. Gordon-Levitt is at his best playing stoic characters with occasional flashes of emotion (such as his amazing turn in Rian Johnson’s Brick), and Adam is no exception. Rogen brings several shades of nuance to the schlubby buddy role, and he can deliver a punchline like no one else in his bracket can. The film is directed by Jonathan Levine, the director of the excellent The Wackness, and I’m glad to see the man carving out a career based on small dramedies that ring true in all the right places. 50/50 doesn’t get too schmaltzy nor does it stray to far into all out farce. Levine nails the tone, and that’s key to getting this ambitous scenario to work. Making cancer funny is hard, but Levine makes it look easy. Mention must be made of the film’s writer, Will Reiser. Reiser wrote the script after battling his own war with cancer, and the autobiographical nature of the film made it something of a passion project for him. Reiser is a very good writer, with a gift for structure that most contemporary comedies lack (lookin’ at you, Bridesmaids…) sorely lack. 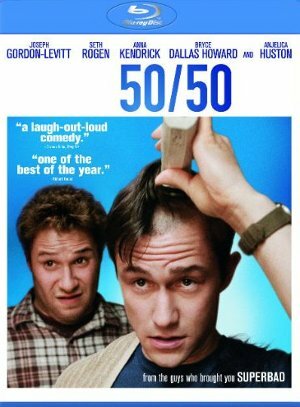 With plenty of laughs and a few tears, 50/50 is one the under-seen gems of 2011. I strongly recommend you remedy that. 50/50 is now available on BluRay and DVD. You can order a copy here. Comments for BluRay Review: “50/50” Makes Cancer Hilarious are now closed.